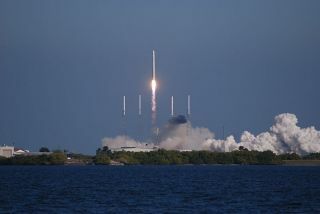 A private SpaceX rocket sailed through a dress rehearsal Thursday (March 1) for the launch of the robotic Dragon space capsule, which could blast off toward the International Space Station as early as next month. The five-hour launch readiness test, held at Florida's Cape Canaveral Air Force Station, went through full countdown procedures, including fueling, for the next Dragon test flight, which is slated for late April. It was designed to check out any potential issues with SpaceX's Falcon 9 rocket, Dragon and associated ground systems. SpaceX officials were pleased with the results. "We ran down the countdown clock to a planned abort at T - 5 seconds at 12:18 p.m. Eastern," SpaceX spokeswoman Kirstin Brost Grantham told SPACE.com in an email. "The test went well." The aerospace firm planned to practice loading cargo onto Dragon today, she added. Photo of actual Dragon spacecraft after its first successful orbital flight. Dragon's upcoming flight will be the second — and, if all goes well, final — demonstration before operational cargo missions begin. During the test, SpaceX wants the capsule to dock with the orbiting lab and unload some supplies, just as it would during an actual cargo flight. The original plan called for the station-bound Dragon to launch on Feb. 7, but in January SpaceX pushed that back to March 20, saying it needed more time to prepare the vehicle. The target date later slipped again, to late April; an exact date won't be chosen until SpaceX works through some minor issues, NASA officials have said. SpaceX is not the only company vying to fill the cargo-carrying void left by the retirement of NASA's space shuttle fleet in 2011. Orbital Sciences Corp., for example, is developing its own cargo freighter under a $1.9 billion NASA contract. The company, based in Dulles, Va., is building its Cygnus spacecraft to carry supplies to the space station, with the first test flight expected later this year. While Dragon will transport solely cargo initially, SpaceX is also working on a crewed version of the capsule that it hopes will carry astronauts to the space station and, eventually, Mars. Other U.S. companies are also developing their own private crewed spacecraft, some (like SpaceX) with NASA funding. The U.S. space agency currently relies on international partners like Russia, Japan and the European Space Agency to launch cargo and crew to the space station. SPACE.com assistant managing editor Clara Moskowitz (@ClaraMoskowitz) contributed to this story. You can follow SPACE.com senior writer Mike Wall on Twitter: @michaeldwall and get the latest in space science and exploration news on Twitter @Spacedotcom and on Facebook.